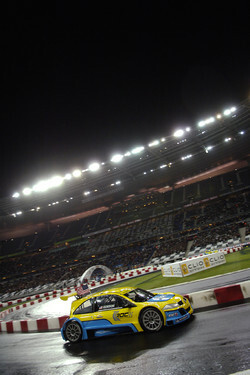 Sebastien Loeb made it to the Race of Champions super final for an unprecedented fourth year in a row, and took the spoils of victory for the second time, adding to his 2003 win. 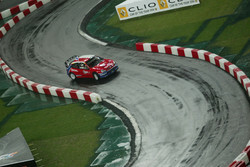 Loeb had won his first Race of Champions two years ago by beating fellow WRC champion Marcus Gronholm in a final, avenging his loss in the 2002 super final, which saw Gronholm edge a close victory over the Frenchman. Finally, in last year's event, Heikki Kovalainen, freshly crowned as the Nissan World Series champion, bested Loeb in the super final. "Winning the Champion of Champions crown here at the Stade de France tonight in front of such a huge home crowd is really something special," said the jubilant Loeb. "I could hear them cheering me on from inside the car! I couldn't be happier." "In rallying, you build up a win over a period of days and you tend to see it coming," he continued. 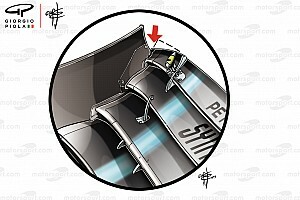 "But in an event like this, you're under pressure from the word go, right up to the chequered flag. You just never know what can happen next." 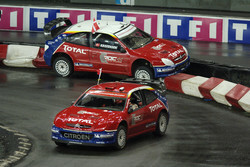 Superfinal 1: Tom Kristensen and S?bastien Loeb. Tom Kristensen, who won the Nations' Cup with Mattias Ekstrom as his teammate, was Loeb's final challenger, having eliminated Kovalainen in the race drivers' final. The Dane pushed Loeb hard in the first race, in Renault Meganes, but had to concede defeat in the end with a time of 1:45.7349 to Loeb's 1:45.6482, the pair having crossed the line literally side by side. That set up the crucial second race, which would be run in the Citroen Xsara WRCs -- the car that Loeb drove this year to his second consecutive World Rally Championship, and one that Kristensen, a road racing specialist, had not sat in prior to this weekend. Given how close it was with the Renaults, it was maximum attack or nothing with the Citroen," Kristensen explained. "I didn't have all that much time to familiarise myself with it and I ended up making an early mistake. I just tried too hard and braked a little bit too late." That mistake did it for Kristensen, as the Le Mans legend crashed into the barriers, allowing Loeb to cruise home in a rather anticlimactic finish to the day. 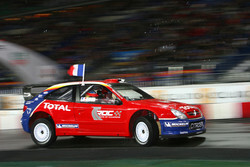 Superfinal 2: S?bastien Loeb passes Tom Kristensen who pushed too hard. 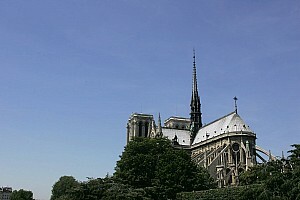 "I can't complain, though," Kristensen said. 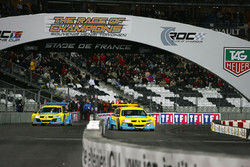 "I won the Nations Cup and I reached the final of the Race of Champions!" Loeb's road to the final saw him first dispatch US motocross star Travis Pastrana and and then longtime WRC rival Colin McRae before coming up against Marcus Gronholm, his chief challenger for the 2005 WRC title and 2002 Race of Champions winner. Gronholm was looking to avenge his loss to Loeb in the 2003 final, after beating Stephane Peterhansel and Daniel Sordo in the opening races. However, Gronholm was unable to challenge Loeb in the rain that was falling on the course, struggling with understeer in the less-than-familar Xsara WRC, and Loeb took the race comfortably, with an edge of 2.4 seconds at the finish. "I didn't drive well this evening," Gronholm admitted. 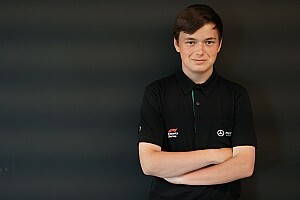 "In the wet it was very difficult and I had a big problem with understeer. I've been beaten by Loeb all year, so I'm beginning to get used to it!" On the circuit drivers' side of the draw, Kristensen had a tougher time. He edged David Coulthard in the opening round in a Porsche 911 GT3, and then beat Nelson Piquet Jr. in a RoC buggy -- each victory by less then a second. In the semifinal, he had to beat Jeff Gordon, who had made it through the first two rounds -- beating Christijan Albers be default when the Belgian's gearbox jammed, and then edging Sebastien Bourdais, suffering from understeer like Gronholm, by two tenths of a second. In the final, though, he had to dispatch Kovalainen, the 2004 Champion of Champions and this year's GP2 series runner-up. 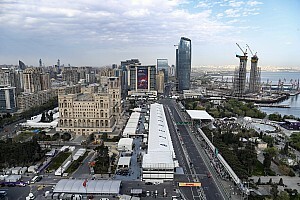 Kovalainen had easily taken the first race over Bernd Schneider, and then edged Felipe Massa by 0.9 seconds. The Kristensen-Kovalainen circuit final turned out to be the highlight of the night, with the seven-time Le Mans winner edging the younger Finn by just seven thousandths of a second. "I had a problem engaging 2nd gear and so that obviously wasn't good for the race," said the downcast Kovalainen after the final. "I am very disappointed." While Loeb took home the title of Champion of Champions, Kristensen was surely the driver of the day. With spectacular drives to take the Nations' Cup for Team Scandinavia first (see separate story), and then a hard-fought loss to Loeb in the superfinal, it was strong finish to an impressive year.